AbdelRahman Ramadan is the RPA Practice Manager at Advansys ESC with responsibility for supporting enterprises to design and implement digital workforce initiatives including the best practices of the robotic operating models, digital change management and RPA technologies. 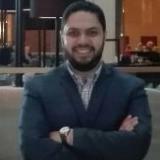 Prior to joining Advansys ESC, AbdelRahman worked as RPA center of excellence lead in Vodafone Technology Shared Services, and successfully managed the delivery and operations of multiple business processes and bots in different business units within HR, Finance, Technology, customer care and Networks Operations. AbdelRahman is a Communication Engineering graduate from Ain Shams University, and before working in RPA he was entitled different roles with Vodafone Group in areas of service management and delivery management. His main assignments were focus in cost reduction and cost avoidance initiatives in the Group within the operations and delivery teams in the shared services centers across India, Egypt, Romania and Hungary. Check out the incredible speaker line-up to see who will be joining AbdelRahman.